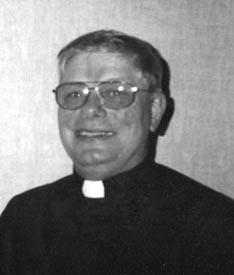 A native of St. Martin, Father John Fleischhacker, will be celebrating his 40th anniversary in the priesthood on Sunday, June 24, at the annual St. Martin bazaar. Father John feels he was swayed to the priesthood by the actions of others, among them his teacher, Walter Determan, at the two-room schoolhouse in St. Martin. "He was a great role model, a great teacher, and a great influence," Father John said. Another person to influence his decision was Father Gilbert Winkelman, a Benedictine priest who was his pastor in sixth grade. "He would listen and pay attention to kids. He made you feel important," Father John added. Father John is the youngest of seven children of Joseph and Anna Fleischhacker. He was ordained as a Crosier Priest in 1961. After further study, he was assigned as a missionary in what was then known as Dutch New Guinea. There, he served among the Asmat people for nearly 19 years. Up to the arrival of missionaries right after World War II, the Asmat people were headhunters. The area Father John served was mostly coastal rain forest where the principle mode of transportation was by boat on the jungle rivers. Wanting to serve as a pastor of a regular church, Father Fleisch-hacker requested to be assigned stateside. In 1981, he was temporarily assigned at Bertha until he received his Moose Lake and Barnum assignments where he served more than four years. He is currently serving the McGregor and McGrath churches where he has been for 15 years.